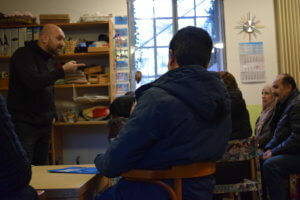 Kava Spartak, director of Yaar, an education and community center for Afghan refugees in Berlin. BERLIN—German Chancellor Angela Merkel is embarking on a fourth term in office after a struggle to form a new government that was prolonged in part by fierce debates over her decision more than two years ago to open the nation’s borders to over one million refugees from Syria and other conflict zones. With far fewer refugees reaching Germany nowadays than was the case in 2015, Merkel’s new coalition government is advancing plans for faster processing of asylum requests and integrating the newcomers. But the nation’s antiquated school structure and a preferential asylum system pose barriers to learning the German language—a key skill the newcomers will need to find jobs and successfully integrate into German society. 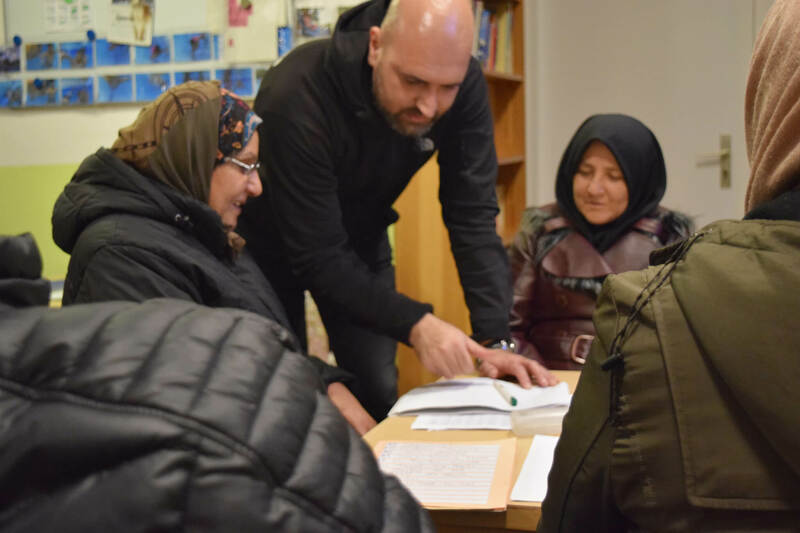 The challenges that the nation and the newcomers face were clear on a recent Friday evening in Berlin’s northwestern neighborhood of Wedding, as the community organizer and educator Kava Spartak tried to help a dozen Afghan refugees learn German. 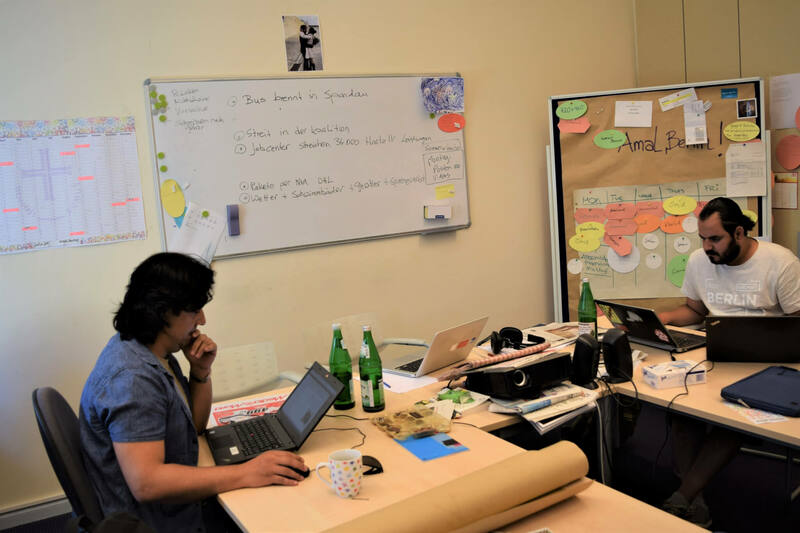 The class, an offering of Yaar Berlin, an Afghan education and community center in Wedding that Spartak helped found in 2012, included people over a range of ages, from their late teens to their 50s, some of whom had no formal education. Though everyone in the class has been in Berlin for more than a year, none could speak even conversational German, meaning that Spartak, teaching in Farsi, had to be imaginative. He wiped his brow to convey the word “summer” and mimed smelling a bouquet of flowers for “spring,” using gestures to drive home the concept for the class’s more basic learners, some of whom can’t read or write even in their native language. Often heralded as a feat of humanitarianism, Merkel’s move to open the borders in 2015 has overwhelmed an education system designed primarily for German natives, said Klaus Hurrelmann, a professor of public health and education at the Hertie School of Governance, a private university in Berlin. Traditionally, Germany routes students into one of three kinds of secondary school based on performance and teacher recommendations after elementary school. Only one of those tracks offers a direct path to university admission. Though Germany has been a nation of immigrants at least since the 1960s, when Turkish, Italian, and Arab “guest workers” were recruited to help rebuild the nation after World War II, the nation’s school system hasn’t changed in structure, arguably much to the detriment of non-Germans. According to a 2015 OECD study, immigrant students in Germany perform about 50 percent worse in subjects like math and science than German students do, even after accounting for socioeconomic status. Teachers simply aren’t versed in how to teach non-German students, who come into classrooms with poor comprehension of the German language and educational backgrounds that differ from the German norm, said Hurrelmann. But studies of the system show that there’s a lack of continuity in how those young people are being educated, primarily due to the fact that German schools differ from state to state, and Germany is seriously lacking in qualified teachers to meet the demand of a growing and increasingly diverse student body. One 2017 study by Germany’s Bertelsmann Foundation concluded that 24,000 additional teachers will be needed by 2025 to accommodate the one million new German and non-German students who will be in the system by that time. Meanwhile, it still isn’t standard for student teachers to learn how to teach German as a foreign language, said Thomas Bauer, head of the Expert Council of German Foundations on Integration and Migration, a nonprofit group that provides policy advice at all levels of government in Germany. “Every fifth resident in Germany has some migration background, so to obtain knowledge of different cultures, of different languages, of how to teach German as a foreign language, should be important for all teachers,” he said. Bauer added that it’s still unclear whether the welcome classes are the most effective model for teaching German to refugee students. Analysts haven’t adequately studied integration methods in the past, he said. Faroz said he comes to Yaar Berlin’s language classes to make up what he’s supposed to be learning in school. Kava Spartak, director of Yaar. Teens like Faroz, however, are lucky that they have direct access to language classes at German schools because they’re young, said Spartak. Older asylum seekers have to prove that they have “good prospects” to stay in Germany—classified by Germany’s Federal Office for Migration and Refugees as those who can prove they need protected status from their countries of origin—in order to win a place in state-run integration and language courses right after they arrive. To date, only those coming from Syria, Iraq, Iran, Somalia and Eritrea automatically qualify for such protection and are fast-tracked for integration. Others from countries like Afghanistan—the nation with the highest number of asylum seekers after Syria—have to wait for a final decision on their application before they can begin to study German, a process that can take years. Though controversial, the government has deemed many parts of Afghanistan “safe places of origin,” a justification it’s used to deport over 800 Afghans since 2016, according to parliamentary figures. Even so, the problems in Germany’s school system are present in educating adult refugees as well, said Bauer. Too few qualified teachers know how to teach German to uneducated adults. Figures from the Office for Migration and Refugees indicate that almost one-quarter of refugees and asylum seekers possess at most an elementary-school education. Around 80 percent don’t have the minimum German language skills necessary to get an apprenticeship or a job, even after taking state-run courses. The new coalition government’s plan for dealing with the problem is to process asylum seekers more quickly by sending newcomers to refugee centers across the country. The new centers would cut down the asylum process to a maximum of 18 months for individuals and six months for families. But there could be negative side effects if the policy isn’t carried out smoothly, said Bauer. “If they stay there for 18 months and kids don’t have access to schools, or individuals don’t have access to integration courses or to independent asylum counseling from independent lawyers, then it’s a problem,” he said. Whatever government initiatives come to pass, Spartak hopes they will help solve issues with teaching newcomers the German language, a skill he sees as pivotal.